We all grow from the time we’re babies. Can going back to the basic knowledge of babies, development, growth and hormones play a role in helping people heal? Yes, not only for healing in wound care, but also for orthopedic applications. Wound care applications can mean the difference between an ulcer healing well or developing further complications. Orthopedically, the healing times of postoperative repair and complications can be decreased. Today, a most promising treatment seems to be utilizing knowledge and tissues of birth. Birth comes about, as you know from two cells meeting together and multiplying and splitting into different tissues, then organs and systems until we are fully formed. How this is done is obviously complicated yet simple with the magic of a mast cell. A mast cell has the capability of changing itself into another type of cell that can then grow into another type of tissue. It enhances regrowth or regenerates. How it does it is the magic. The results of this magic tissue some years ago were accidentally stumbled upon, like many science break through. It was noticed after a fetal surgery, that the baby once born had absolutely no scarring from the incisions that it had incurred in utero, inside the mother. 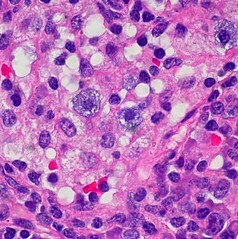 The amniotic tissue has an abundant amount of mast cells that can change to whatever tissue is needed. This tissue was later used in eye surgery. It is now utilized in the foot and ankle. Amniotic tissue transplantation, the “Birth Tissue” is now being used to cover ulcers and skin deficits. It allows a much faster healing time than was conventionally experienced and with less scarring. This amniotic tissue transplant material is even being used to cover cartilage and bone in joints, such as those receiving a cheilectomy, around damaged tendons for Achilles tendon and peroneal tendon repair, around nerves such as in tarsal tunnel repair, etc. Research is even being performed to apply this tissue in a gel like format for large areas of tissue deficit. The results could be tremendous. So what about the hormones? Hormones are now found to play an important part in wound healing. For example, it has been found that estrogen can reduce inflammation in wounds. This is good as inflammation slows the healing of wounds. Testosterone will do the opposite. Therefore, if you have a wound, it is important to avoid low levels of estrogen and high levels of testosterone. Most importantly, this should be monitored in ulcers of postmenopausal women. If you are suffering with a wound, be sure to contact Dr. Sables for help. Hickory Hollow Foot & Ankle Center and ArchMasters-Orthotics, Shoes& Footcare, LLC. Post Season Home Grown Tomatoes, with Extra Protein.